Marking a return of sorts to one of his many sets of old stomping grounds, Cardinal Angelo Scola spent yesterday at Washington's John Paul II Center. Many of you would realize immediately that, as the patriarch of Venice's daylong program of Catholic-Muslim dialogue took place at what (these days) usually serves the World's Most Expensive Catering Hall, not even many locals had any inkling he was in town. EWTN, however, knew, and conducted an extended interview with the current holder of the post that produced three 20th century Popes -- St Pius X, Bl John XXIII, and John Paul I -- and, so some maintain, will vindicate its rep in the next conclave as the launching pad to that other place whose name begins with a V.
Once upon a time, before rising to the helm of the church in Gondola Central and a place in the Pope's kitchen cabinet, Scola spent a period of his academic journey on the campus of the Catholic University of America as a visiting scholar. A "cielino of the second hour," as he's been described within Communion and Liberation, the cardinal's US itinerary wasn't able to include last weekend's national diakonia of Benedict XVI's favored movement in San Diego. His schedule does, however, take him to New York tonight where, as previously mentioned, another dialogue will be held, this time featuring the patriarch alongside a rabbi and an imam, to celebrate the presentation of the cardinal's journal Oasis -- geared primarily toward Catholics in majority-Muslim nations -- at the headquarters of the United Nations. Touted as a papabile in the last papal election cycle, the well-traveled, well-studied Scola turned 65 in November, so he's a relative youngster as his fellow red-hats go. Inside and outside the church, observers sometimes describe Cardinal Scola as a cultural warrior with a penchant for bluntness. Local Catholics relate that, at a 2002 ceremony to mark his official entrance into Venice, the city's politicians spoke in customary elliptical terms about the church's proper place in what is predominantly a lay culture. 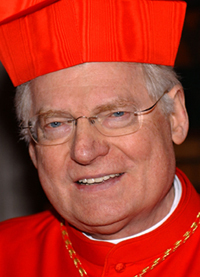 In response, Cardinal Scola made it clear that he was not going to be boxed in by archaic arrangements that limited the church's influence or voice. Cardinal Scola quickly discovered was that many Venetians were not comfortable with such a high-profile and ambitious role for the church. One elderly priest reminded the cardinal gently that "in Venice we move around by gondola." It was go-slow advice that the cardinal never took. Father Fausto Bonini, a parish pastor in Mestre, said Venetian Catholics did not immediately take to their new patriarch, but his open personality gradually won over most people. He recalled when Cardinal Scola brought a parish catechism class to life with a rapid-fire question-and-answer session. Others say they were amazed to see the cardinal playing foosball with drug addicts during a pastoral visit, or actually sitting down to eat with the homeless at a soup kitchen instead of doing the routine pass-through. "If you can get the text out of his hands, he's a great communicator," said one priest. In an interview with Catholic News Service in December, Cardinal Scola said communicating effectively was essential to being a good pastor -- and something that is not always easy. What convinces people more than well-reasoned arguments, he said, is the ability to translate those arguments into experience. The heart of Cardinal Scola's message these days is that the church has real answers to the problems of modern men and women, particularly in restoring meaning to the concept of freedom. But, even on such basic topics as the permanence of marriage, the church's arguments are frequently misunderstood, he said. "One reason for the misunderstanding is that we Christians often propose this moralistically instead of giving reasons, instead of convincing. This is a weakness of ours," the cardinal said. "We Become What We Do"
"...Now Off to Ontario -- and Dalton McGinty"